MEIK WIKING STUDIES the art of having a good time for a living – he’s a happiness expert. He’s CEO of the Happiness Research Institute and author of The Little Book of Hygge: Danish Secrets to Happy Living. 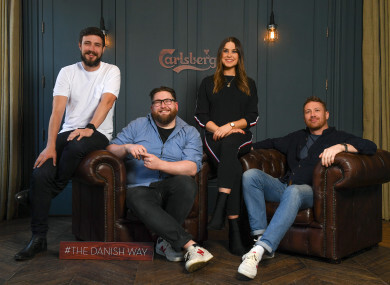 He’s in Dublin to launch ‘The Danish Experiment’, a web-series created by Carlsberg which will follow four eclectic Irish personalities as they explore the Danish way of living, learning what makes them so different to their European counterparts. There are a lot of similarities – you have the word ‘craic’ which is quite close to the Danish ‘hygge’ because they’re both about hanging out with your mates and having a good time. Carlsberg’s series hopes to dive into what about the beer’s home country is so unique – bringing Irish people a taste of what’s so enjoyable about how the Danes tend to socialise, eat, get creative, entertain and even style their homes. We might be Irish and Danish but we’re first and foremost humans and we can see that the same things drive happiness and wellbeing across the world. Hygge is just one of the success stories that has been spreading to Ireland – we’ve also seen an explosion in popularity for ‘Danish-noir’ TV, while the fashion world has adopted their clean lines and minimalism. So, with so many success stories, how do Danes have life so sussed? The series will see street artist Maser, stylist Jo Linehan, food trailblazer Kevin Powell and Kodaline bassist Jay Boland all discover what they can learn from Copenhagen to take to their creative careers back home. They’ll travel to Copenhagen for four days and be paired with a local creative, exploring how the Danes could influence their approach to interior design, art, music and food. In the last few years, Ireland has increasingly looked to Scandinavia as a leader in interior design – something that is reflected with the explosion of affordable Danish stores across Ireland to the dominance of modernist style pioneered by Danish designers. Their whole cosiness thing really speaks to Irish people because we have that cold climate so we do sometimes just want to come home and be super cosy and warm. As a creative person you become very comfortable in what you do. This is an amazing opportunity to pull myself out of my comfort zone and collaborate with someone with a completely different take on things. Interior design isn’t the only realm where the Danes have been making waves however. Copenhagen alone has claim to 19 Michelin stars, awarded to 15 restaurants. It’s a city in which restaurants like Noma are creating seasonal, ‘super-focused’ menus that only include say fish, or vegetables. The Irish restaurant scene has been influenced by Scandinavian eating. We have lots of similarities in what we grow and produce and I think the idea of provenance is becoming a big thing for Irish people. Want to find out what makes Denmark one of the happiest places in the world? Keep an eye out for the first episode of The Danish Experiment, which will be unveiled on TheJournal on June 14th. Follow Carlsberg Ireland on Facebook and Instagram to tune in to the series and for behind-the-scenes edits . Enjoy Carlsberg sensibly, visit drinkaware.ie. Email “Four Irish influencers are headed to Copenhagen for this new series - here's why ”. Feedback on “Four Irish influencers are headed to Copenhagen for this new series - here's why ”.